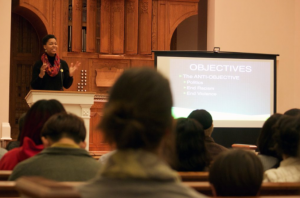 Nearly 100 participants attended the “Together Oxford” community workshop, where they learned to check their privilege and work past racial divides Monday night at Paris-Yates Chapel. Jandel Crutchfield and Tony Caldwell with the Ole Miss Department of Social Work moderated the event. The workshop is a continuation of “Together Tupelo,” which took place earlier in 2016 after Antwun “Ronnie” Shumpert was shot and killed in the community by a local police officer. Crutchfield, who grew up in Baton Rouge where Alton Sterling was also shot and killed by a police officer the same summer, said she and Caldwell felt moved to help people cope with the hurt in the aftermath. “There’s still a bit of unrest,” Crutchfield said. She said the program is more focused on giving people the tools and perspectives of understanding across racial divides by starting and continuing conversations. Caldwell gave a short lecture on overcoming distrust and hatred of other people. “I don’t know if reconciliation is the correct language,” Caldwell said. Caldwell said the history of African-Americans in the United States is a painful one. He said it was also never a healthy one between races. “History repeats itself because we don’t heal,” Caldwell said. After Caldwell and Crutchfield both spoke, they passed out surveys where participants checked off boxes next to advantages they were born with, including being white, male and born in a family with two college-educated parents. After everyone had tallied their unearned advantages in life, groups were matched by the number of advantages and asked to speak with others in their group. The least fortunate in privilege were both minorities. The more privileged group was all white. Toward the end of the exercise, groups from polarized privileged groups were asked to interact with one another as well. Caldwell also lectured on social mobility during the exercise and said depending on where a person’s parents are on the spectrum does not determine his or her success, but “hard work” is relative to where an individual begins in life. Ashley Mathis, a senior social work major who participated in the privilege check, said she thought the exercise was very interesting to her as a student. Although Mathis was in the three to four privileges category, she is nearing the completion of a college degree. “It showed where everyone is, but also where everyone started,” Mathis said.